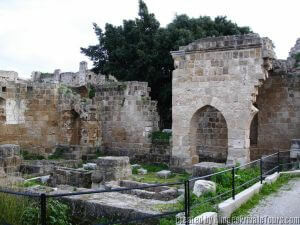 During the early Christian period, Rhodes belonged to the Byzantine Empire. The Byzantine period lasted on and off for almost 1,000 years. During this time, Rhodes was an important Byzantine trading port and a crossroads for ships sailing between Constantinople and Alexandria. Beginning in 600 AD, Rhodians began to develop a codified in a collection of maritime laws (Nomos Rhodion Nautikos) which have influenced admiralty law up to the present. It was also an important Byzantine military base. The Acropolis (later the Grand-Masters' Palace) and the Upper Town which is the surrounding area of the acropolis (later the Collachio). The Lower Town (later the Burgum). 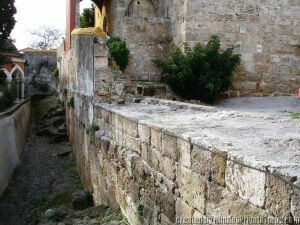 Today parts of this fortification survive mostly in the Collachio, incorporated into later structures. 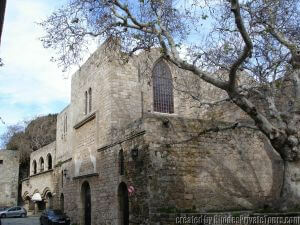 Rhodes city had a great number of churches, among them some basilicas of impressive dimensions. 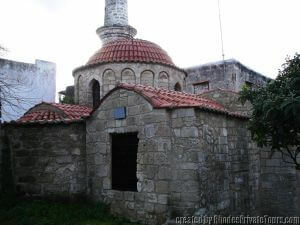 The thirteenth century Byzantine Church of St Mary (Panagia tou Kastrou or Virgin of the Fort), which later became the first cathedral of the Knights. Byzantine church of St Constantine and Helen 12th - 13th c.
The clock tower stands on the site of the original north-west tower of the internal fortifications of the Collachium, (former Byzantine fortifications). 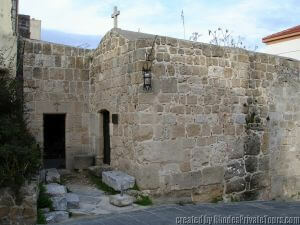 Early Christian Byzantine church of Archangel Michael. 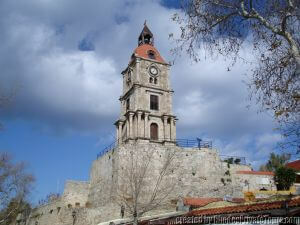 Byzantine church of St. Spyridon of 13th c (which is converted to mosque during the Ottoman era). 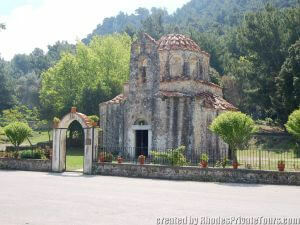 Byzantine church of St Nicholas Fundukli 15th c, at the foot of the mountain Profitis Ilias. 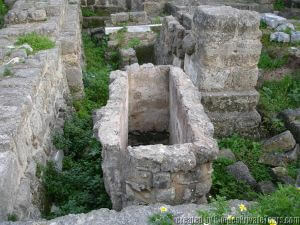 We have little information concerning the Byzantine period. The restoration work of the Italians neglected surviving buildings in favor of the Knights period.